Ever since we discovered the Trader Joe’s frozen pizza crust, we’ve become pizza experimenting experts. 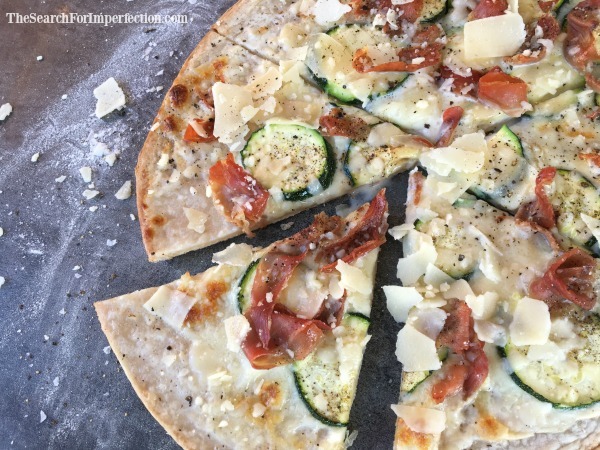 This Prosciutto Zucchini Pizza is no exception, and did not disappoint! I was inspired by an impulse magazine purchase in the check out line of Target. I honestly haven’t bought a magazine in AGES, other than my subscription to Bon Appetit. But I opened up the “centerfold” and it was a beautiful picture of zucchini parmesan toast. I was immediately inspired to make something with zucchini, and I happened to have prosciutto in the fridge, along with some fresh mozzarella and a couple of frozen pizza crusts. All I needed was sauce. While I’m sure marinara sauce would be just fine, I felt a garlicky alfredo sauce would best suit a prosciutto zucchini pizza. So I picked up a jar next time I was at the store. Trader Joe’s jarred alfredo sauce is by far the best we’ve tried. My husband was worried the zucchini would need to be pre-cooked before putting it on the pizza. I’ve found that most toppings, even broccoli (one of my faves) get to the perfect amount of doneness when cooked right on the pizza. The zucchini came out cooked to perfection.